S&P's Rating A Warning To End Partisan Dynamics : It's All Politics The downgrade by Standard & Poor's is guaranteed to become a major piece of evidence used by Obama's political opponents against him, as they make the case that he has failed to lead the nation and should not be rewarded with a second term. 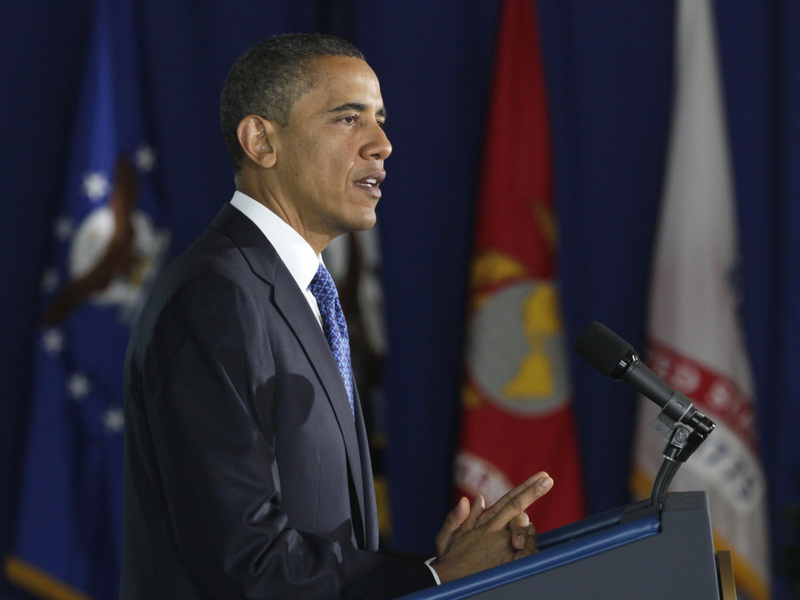 Standard & Poor's downgrade of the U.S. credit rating Friday will play a role in President Obama's political future. President Obama may have escaped for the moment at least becoming the first U.S. chief executive to preside over a U.S. government default on its debts. But he now holds the dubious distinction of becoming the first president on whose watch the nation's debt was downgraded by a major credit-rating agency as Standard & Poor's on Friday cut the rating on U.S. long-term debt to AA-plus from the highest level, AAA. The downgrade is guaranteed to become a major piece of evidence used by Obama's political opponents against him as they make the case that he has failed to lead the nation and should not be rewarded with a second term. "America's creditworthiness just became the latest casualty in President Obama's failed record of leadership on the economy. Standard & Poor's rating downgrade is a deeply troubling indicator of our country's decline under President Obama. His failed policies have led to high unemployment, skyrocketing deficits, and now, the unprecedented loss of our nation's prized AAA credit rating. Today, President Obama promised that 'things will get better.' But it has become increasingly clear that the only way things will get better is with new leadership in the White House." The president's political future will clearly rest partly on whether he is able to convincingly refute such charges. He will have to persuade voters that he was more sinned against than sinning in the political dysfunction that existed even before Republicans took over the House in January. To the extent that downgrade of U.S. debt adds to the overall impression on voters' part that the nation is on the wrong track, the president's chances for re-election may have worsened Friday. Clouding the situation is that S&P made a math mistake in its earlier analysis to the tune of $2 trillion which the Treasury Department discovered Friday and brought to the ratings agency's attention. S&P later released a statement saying it had revised its numbers, but that the credit rating still stands. The Obama administration's immediate response after S&P's action was to accuse the ratings agency of acting in haste and making an even larger error than faulty arithmetic by proceeding apace with the downgrade. The administration's first instinct appeared not to be to blame Republicans, especially the Tea Party, for playing a role in the downgrade. But that could change in the coming hours, days and weeks. Meanwhile, congressional Republicans have plenty to worry about, too. Recent surveys of public attitudes by the most credible polling organizations have repeatedly indicated that Americans faulted the GOP more than Obama for how the recent debt-ceiling fight played out. Voters perceive Republicans as less willing to compromise. GOP leaders have even encouraged that view by suggesting that the very idea of making concessions is antithetical to them, a violation of their principles. They did so even as Obama positioned himself as being willing to deal. Not only were congressional Republicans facing new challenges because of S&P's decision. GOP presidential candidates likely also run the risk of turning off many voters, especially political independents, if they seem more concerned about using the downgrade as a partisan cudgel against Obama than offering credible policy solutions. S&P's action was clearly a rebuke of both Republicans and Democrats as it warned that if the current partisan dynamics in Washington didn't change, further downgrades could occur. The ratings agency expressed what sounded like a fatalistic disappointment that that Washington policymakers were so entrenched in their ideological positions that common sense solutions to the nation's mounting fiscal problems were a casualty. "In May, I warned, 'if we don't act boldly now, the markets will act for us very soon.' It is my hope this wake-up call will convince Washington Democrats that they can no longer afford to tinker around the edges of our long-term debt problem. As S&P noted, reforming and preserving our entitlement programs is the 'key to long-term fiscal sustainability.' "
Boehner's statement, with its partisan fingerpointing and silence on the need for new tax revenues, represented just the sort of partisanship and unwillingness to put everything on the table that caused the ratings agency to downgrade the U.S. debt in the first place. In this respect, Obama may be somewhat better positioned than the Republican leadership since he, at least, has been open to the idea of reforming entitlements while Republican leaders have insisted publicly that increasing tax revenues is a non-starter. S&P has underscored with the downgrade heard 'round the world that the positions of hardliners on either the entitlements-are-untouchable side or the anti-tax side of the policy debate are untenable. There is the possibility that the ratings downgrade could actually provide Republican leadership with some political cover. It could give them the necessary space to accept what many experts from both parties say is the only way the nation's long-term fiscal problems can be solved, through a combination of cuts to entitlement benefit and tax increases. It could allow Republicans to shift their position on taxes toward at least admitting the possibility of raising some taxes in order to prevent future debt downgrades. If Republican leaders react that way, they could turn to the proposal by the Senate's "Gang of Six," which includes measures that would raise tax revenues. But it could also give Democrats cover to make some difficult course corrections, too. For instance, it might allow more Democrats, like Rep. Nancy Pelosi, the House minority leader, to move off her position that entitlements can't be touched. By moving now with a downgrade, S&P may have also changed the political calculus for congressional leaders who must choose who will serve on the super committee of 12 lawmakers required by the debt-ceiling law. The panel's task will be to recommend, by the end of the year, $1.5 trillion worth of spending cuts to be made over 10 years. Those cuts would be in addition to the nearly $1 trillion in spending reductions over the same time period that debt-ceiling negotiators agreed to in order to end the governing crisis that brought the nation to the brink of default. Whether S&P's move will have the intended effect on the nation's political actors was unclear. Even before the debt-ceiling crisis ended, the ratings agency had warned that an agreement might not prevent a downgrade. It would take credible deficit-reduction action on the part of Washington policymakers. Also, some Republicans discounted the impact of a downgrade, saying the nation's fiscal situation was so precarious that it deserved to have its debt downgraded. But should S&P's downgrade result in significant added financial and economic distress for American voters, that almost cavalier attitude toward a downgrade may prove fairly unpopular. Further, recent polls have also indicated that the Tea Party has lost popularity. If voters come to blame the grassroots movement for the loss of national prestige and pride that goes with the downgrade, the Tea Party could find itself falling even further in public approval and end up losing its sway in American politics as quickly as it gained it. One of the most important aspects of the S&P decision may be to give the nation's political leaders the courage to go before the American people and make the case for unpopular policies — both tax increases on not just the richest Americans but the middle class, too, and cuts to entitlement benefits. Experts say both are necessary to make real inroads. Most Americans have so far generally been opposed to both. But Friday's historic downgrade gives the need for an informative, thorough and honest discussion of such policies all the more urgency.